Jordan Marr makes another great save. 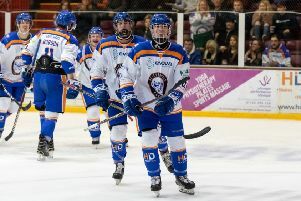 It’s advantage Peterborough Phantoms at the halfway point in the NIHL Division One South semi-final play-offs. The city side staged a rousing comeback in the away leg at Basingstoke Bison last night (March 30) and will take a 3-2 lead into the second leg at Planet Ice tonight (5.30pm). Bison went 1-0 up after 12 minutes with a goal by Hallam Wilson and increased it to 2-0 at the start of the final period through George Norcliffe. Petr Stepanek then started the Phantoms comeback with a fierce shot that found the back of the net on 45 minutes and a minute later Scott Robson levelled it up. Then with six minutes remaining up popped young Jarvis Hunt to tap in the winner after Taylor Romeo’s shot had been saved. Jordan Marr was in superb form for Phantoms and pulled off many fine saves between the pipes.